Richly illustrated with hundreds of photos, including views of one of the oldest synagogues in the world, this beautiful volume contains biogaraphical information on several centuries of rabbis of Aleppo and Damascus - 600 of them - and their ideals, teachings and some of their best-loved pizmonim. 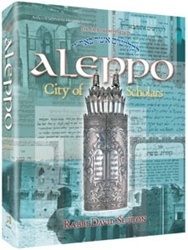 Aleppo - City of Scholars is a fascinating work and an authoritative reference. Yet it reads like a family chronicle - one that was written by a scion of Aleppo who both cherishes and reveres the luminous Judaism of this ancient community.